Our mission is to make your ideas a reality, creating superior mobile experiences which exceed your expectations. We fill our portfolio with innovative products and solutions, providing inspiration and embracing the power of mobile. Driven by technology, innovation and creativity, we help enterprises to achieve their business goals and respond to the opportunities and challenges they face on a daily basis. After many years in the software industry, we understand better than anyone else the importance of collaborative relationships. We work close with our customers to develop the best tailored solutions and ensure that all steps in the development process meet customers’ expectations and business objectives. Sirma Mobile emerged from the biggest Bulgarian group of IT companies, Sirma Group Holding, in late 2008. With a proven track record dating back to 1992 and over 20 years of successful development and worldwide penetration , Sirma has been changing the way software is made. Our expertise covers a wide range of industry verticals, offering state of the art enterprise and consumer solutions. Currently, Sirma Mobile has offices and representation in US, Norway, Brazil, Canada and Bulgaria. We also take pride in being Motorola’s preferred partner for iSIM products and services. Our team consists of young and talented developers, project managers, testers and designers, working hard to create some of the finest mobile apps and make Sirma Mobile a leading mobile developer. We have a dedicated team for all major platforms available on the market, specialized in creating the mobile solutions that you love. Our determination and passion for quality is our secret for delivering successful projects – the way you want them to be. Limits, safety and localization - these are bipper's 3 services. 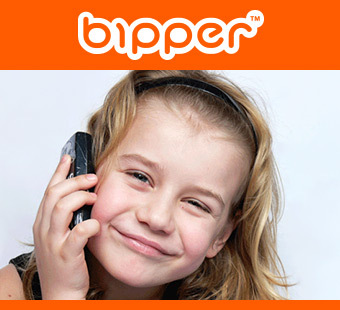 With Bipper parents can take part in their kids "mobile live".